If your job includes estimating from blueprints or detailed scale drawings, do yourself a favor and check out the ways that a digitizer can simplify, reduce the time and improve the accuracy of your takeoff. A manual takeoff normally consists of taking measurements and quantity counts from a set of blueprints using a scale ruler and a pencil, and when you're finally done, you hope that you didn't leave anything out. Right? This entire process can be accomplished quickly and easily using a GTCO Super L VI or Roll-up III digitizer along with a "Takeoff Solution". No matter which trade you work in, electrical, mechanical, concrete, drywall, framing, etc., etc., you can use a digitizer to accurately do the measurement calculations for you. It will measure any way you want it to, in lineal feet, square feet, square yards, irregular areas, etc., etc., just by tracing an outline, selecting an object, clicking on endpoints, and so on. In short, this will greatly reduce the time you need to produce high quality takeoffs, enabling you to pursue more bids and win more contracts. The digitizers and takeoff solutions listed are compatible with virtually every estimating software program in use today. 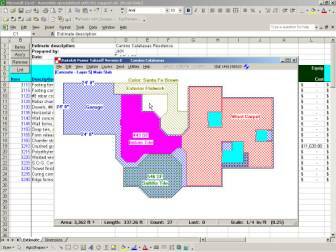 You can even use Microsoft Excel® as your estimating program if you want to. With GTCO digitizers being the industry standard, you can depend on the assurance of continued compatibility, making your purchase a sound investment by bringing you more options now and when you may need them later.